Take a look back at the range of over-the-top characters Johnny Depp has played throughout his career. Paul Kemp, "The Rum Diary"
Paul Kemp, "The Rum Diary" (2011): Based on Hunter S. Thompson's early, semi-autobiographical novel about American journalist Paul Kemp (Depp), who joins the San Juan Star in Puerto Rico in 1960 and, between drinking binges, uncovers a web of corrupt politicians and land developers. Ed Wood (1994): Odd choices have actually been key to Depp’s popularity, which blithely crosses demographic boundaries: Very young people like his crazy movies and actorly freedom; older young people like his hipness. Older older people -- even encrusted film critics -- like that he makes these crazy movies at all, and looks contemptuously amused while attending the Golden Globes. But “Ed Wood” is probably the epitome of eccentric Depp choices, one he imbued with a combination of artistic ambition, demented grins and utter delusion. The king of bad B movies (“Plan 9 From Outer Space”), Wood was the perfect vehicle for the actor’s more outlandish instincts and the movie remains an underappreciated gem (although Martin Landau did win an Oscar for playing Bela Lugosi). Edward Scissorhands (1990): The first of his many films with director Tim Burton, this offbeat fable about a young man with scissors for hands was Depp’s first foray into the decidedly strange. Perhaps it was foretold: His film debut was “A Nightmare on Elm Street” (1984) and he’s never quite left the macabre very far behind. “21 Jump Street,” the TV crime series about cops infiltrating high schools, made the young Depp a teen idol, and that may been the trigger, the thing that sent him off in an entirely different direction -- including the warm embrace of Burton. Bon Bon, "Before Night Falls"
Bon Bon, "Before Night Falls" (2000): In a portrayal that would have made Ed Wood proud, Depp plays a flamboyant, outrageously bewigged transvestite who smuggles the manuscripts of oppressed writer Reinaldo Arenas Javier Bardem) out of Cuba. Depp does double duty in this Julian Schnabel epic, as both Bon Bon and Lieutenant Victor, a vicious military interrogator. Depp gets only about five minutes of screen time but is unforgettable. The Mad Hatter, "Alice in Wonderland" (2010): Depp was certainly mad, but multidimensional as well, bringing a great degree of humanity to one of his more excessive characterizations. Willy Wonka, "Charlie and the Chocolate Factory" (2005): A less candy-coated movie than the Gene Wilder-powered musical of 1971, and one much closer to the dark tone of the Roald Dahl book, this Tim Burton extravaganza features Depp making far too great an effort to be unusual. That his Willy Wonka so strongly suggests Michael Jackson makes it almost too creepy. Raoul Duke, "Fear and Loathing in Las Vegas” (1998) — “As your attorney I advise you to drink heavily”: Terry Gilliam’s adaptation of the Hunter S. novel, with Depp as the drug-addled and often hallucinating Thompson stand-in Raoul Duke, probably defines the actor as a vehicle of social outrage and willful derangement. William Blake, "Dead Man" (1995): Directed by indie icon Jim Jarmusch, this otherworldly Western featured Depp as an accountant who, after murdering a man and escaping west, begins a spiritual odyssey led by an Indian guide named Nobody (Gary Farmer). Depp has certainly done what might be call “straight” roles throughout his career -- from the mob-busting FBI agent in “Donnie Brasco” (1997) to John Dillinger in “Public Enemies” (2009) to, one could argue, the curious character he played in the much-derided so-called comedy “The Tourist.” While William Blake wasn’t the most outré role in his oeuvre, the movie around him made “What’s Eating Gilbert Grape (1993) seem positively conventional. 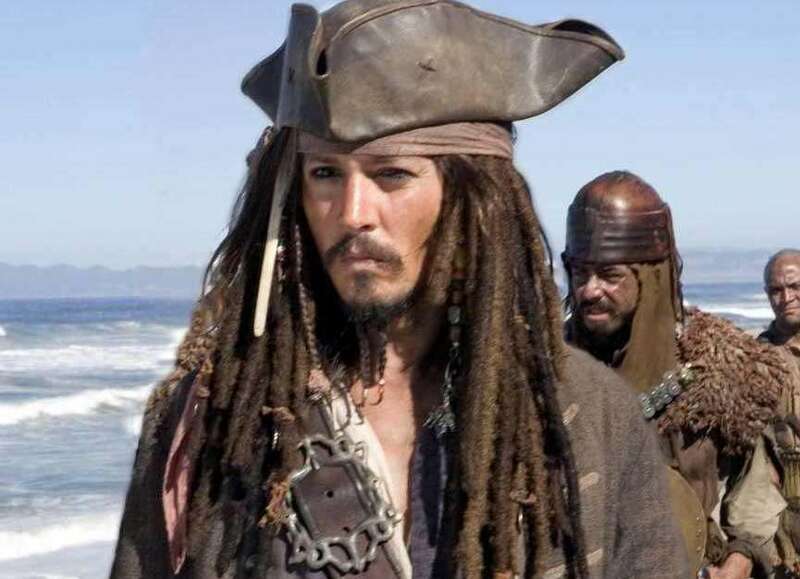 Jack Sparrow, "Pirates of the Caribbean" (2003-2011): Depp seems able to exploit Hollywood, rather than vice versa. The whole “Pirates” enterprise -- a movie based on a theme-park ride? -- looked like a distinct sellout when it first set sail. But the supposedly Keith Richards-meets-Pepe le Pew-inspired Jack Sparrow made the whole thing a lot hipper than it might have been. Stranger tides, indeed. John Wilmot, “The Libertine” (2004): Even with Depp, sometimes you have to wonder. In this ornate period piece by first- and apparently last-time director Laurence Dunmore, Depp plays the licentious 17th century poet John Wilmot, aka the Earl of Rochester, who famously debauched his way to an early, syphilitic, alcoholic grave. Depp is a convincingly reprobate member of the Restoration court of Charles II (John Malkovich), but the movie has to rank as the least-seen film in what has otherwise been a very visible and entertaining career. Mortedecai (2015): Depp takes the title role in "Mortdecai," a caper comedy about an art dealer and part-time sleuth improbably named Lord Charlie Mortdecai. He's an effeminate dandy with an absurd handlebar mustache and a plummy British accent who's known worldwide as a blustering dimwit and chronic bumbler. Over-the-top, yes, but Depp's strenuously unfunny performance turns a frivolous caper comedy into a grim death march to the closing credits. 25 movies with the highest number of sequelsThe "Godzilla" franchise takes the title as the film series with the most sequels (29 movies total), but what other movies come close? The 50 biggest box office hits of all timeThe highest-grossing movies, worldwide, of all time. Here's what's On Demand right nowWorthwhile options, from Oscar winners to independent newbies.